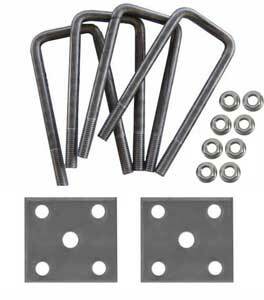 A - Thread Diameter: 9/16"
C - Inside Length: 6-3/4"
Trailer U-Bolts for round or square axles, our 4203-L U-Bolts are available for any trailer spring or axle application. If your U-Bolt is not listed we can make you a set. U-bolts are designed to stretch when installing to aid in torque retention. Upon removal they retain the stretch, therefore we recommend you do not reuse old U-Bolts.